From just north of Tokyo, Ide grew up as Japan was becoming a force in Formula 1 racing and when he was 15 years old began racing in karts and quickly rose to become a leading national kart racer. At the age of 19 he made the decision to jump straight into Formula 3 with his own team and then with Asada Racing in 1995. He dropped out of the series in 1996, did only two races in 1997 and half a season in 1998. His career was going nowhere. But in 1999 Aguri Suzuki picked him to drive a Nissan Silvia, run by the Autobacs Racing Team Aguri (ARTA). He finished second in the GT300 class and also competed in the new Formula Dream series, winning one of the six races. He thus returned to Japanese Formula 3 in 2000 and driving a Dome-Mugen for ARTA finished runner-up to Frenchman Sebastien Philippe. He stayed on in the Japanese F3 series in 2001 with a Three Bond Dallara-Nissan, while also racing for Nissan in the GT300 class before heading off to Europe in 2002 with backing from ARTA to compete in the French F3 series with Team Signature and finished seventh in the series. In 2003 he went back to Japan and joined the Formula Nippon scene, finishing seventh that year driving for the Cosmo Oil Cerumo team. 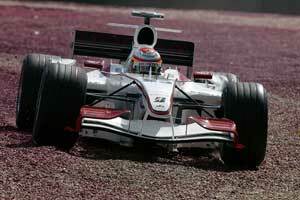 He switched to Team Impul in 2004 and was fourth and finished runner-up in the series in 2005. This was enough to earn him the chance to move to F1 in 2006 with Aguri Suzuki's new F1 team. Sadly, this proved to be a disaster. After struggling to get on pace with his Japanese team mate Takuma Sato in the first four races, the team demoted Ide to a testing role - acting on the advice of the FIA. Ide returned to racing in Formula Nippon with the DoCoMo Dandelion team.